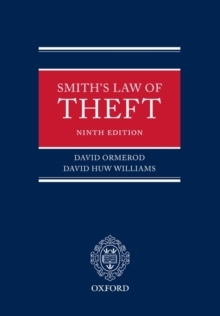 Smith's Law of Theft has long been established as the definitive work on the subject and is frequently cited in the appellate courts. Now in its ninth edition, the book provides a detailed and critical account of the law of theft and related dishonesty offences. It contains the full, amended text of relevant legislation (notably, the Theft Acts 1968, 1978, and 1996) together with a detailed analysis of the provisions of the statutes and the extensive caselaw which has grown up around them. This new edition has been comprehensively rewritten and updated to take full account of the Fraud Act 2006, which has replaced the deception offences with new fraud offences. There have been major changes in other areas of law besides fraud, and the authors offer expert analysis of case law developments such as Hinks in the House of Lords on theft and gift, jurisdictional issues arising from Smith; and of procedural changes introduced by the fraud protocol and the imminent introductionof judge only trials. A whole new chapter on conspiracy to defraud is included in the new edition, and the full text of the Fraud Act and the fraud protocol are included in the appendices.